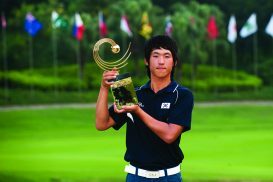 Han Chang-won of Korea enjoyed the finest moment of his young golfing career when he booked a place at the 2010 Masters Tournament and International Final Qualifying for the 150th anniversary Open Championship at St Andrews with a dominant victory in the inaugural Asia-Pacific Amateur Championship in China. Leading by two shots overnight, the 17-year-old earned a trip to Augusta National by crushing the competition with a final-round 2-under-par 70 at Mission Hills Golf Club’s World Cup Course, located about 90 minutes north of Hong Kong. Han finished with a 72-hole total of 276 (-12), five shots in front of compatriot and playing partner Eric Chun, who could only manage a 73. Chun would join his countryman in the final qualifying stage for the 2010 Open Championship. Three players – Korea’s Kim Meen-whee, Peter Spearman-Burn of New Zealand and Jordan Sherratt from Australia – shared third at 282, with Australia’s Matthew Giles sixth, one shot further back at 5-under-par 283. In an indication of the depth of the field, seven different APGC member nations were represented in the top-10 places at the championship’s conclusion. Understandably, Han was thrilled with the victory. “I knew I was leading by five or six after the first nine holes, but I was trying not to think about the result. “Anything can happen in a round of golf and I was very nervous towards the end. I have to admit that it was the thought of playing in the Masters that made me nervous. I had never even thought it would be possible for me to be playing in the Masters as an amateur,” said Han. The inaugural Asia-Pacific Amateur Championship was held at Mission Hills Golf Club’s World Cup Course in Shenzhen, China. Shenzhen is located in southern China’s Guangdong province, approximately 90 minutes north of Hong Kong. No weather delays. Sunny and humid with highs each day reaching approximately 31 degrees Celsius.